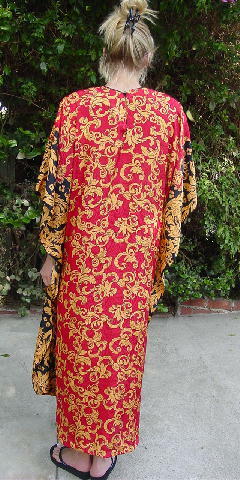 This vintage caftan is 100% polyester and is by Ruth Norman New York and was originally sold at Neiman Marcus. It has an 8 1/4" deep V neckline with black cording around it, shoulder pads, and a back top 5 1/2" long opening with a black one button closure. 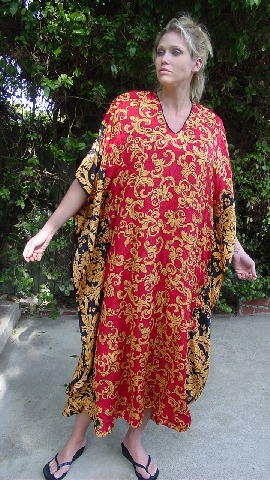 There is a tone-on-tone design pattern in red, black, and honey. It has rounded bottom side seam 19 1/2" long slits. neckline to top end of sleeve 18 1/2"
side to side at vertical seam 27 1/2"
side to side bottom hem 41 1/2"